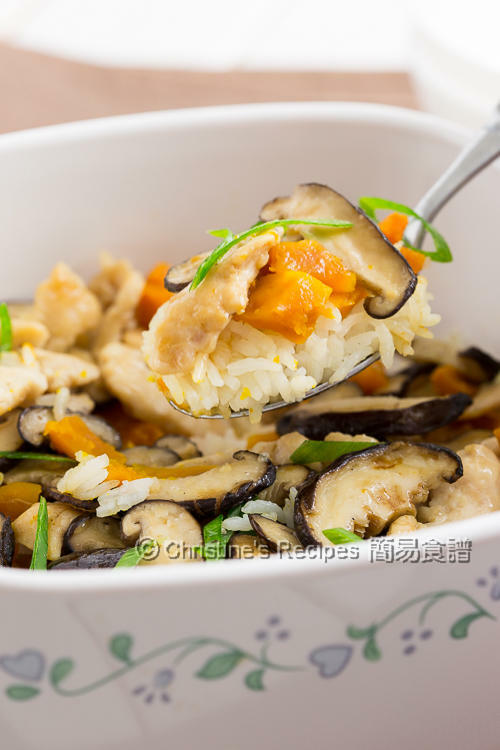 The grains absorb all the flavours of the chicken, mushroom and pumpkin. It's so delicious and nourishing. 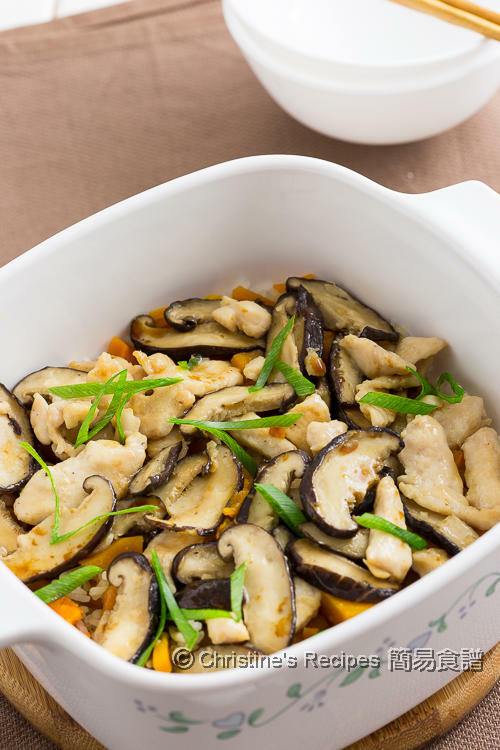 Pumpkin, mushroom and chicken are nutrition packed ingredient individually. I tried putting them together to make a one-pot rice dish, and it turned out deliciously nourishing. The method I used is quite similar to making traditional Chinese hot-pot rice. As I wanted to easily control the moist level of cooked rice, I stir-fried the shiitake mushroom and chicken in a wok separately, followed by popping them onto the rice. If you have a rice cooker, you may put all the ingredients into it and let the machine do all the job for you for convenience. Mix the chicken with marinade well. Set aside for 20 minutes. Rinse the rice and soak for about 20 minutes. Drain well. Put into a deep pot with the chicken stock. Cook over medium high heat and bring it to a boil. Reduce heat to medium low. Continue to cook for 10 minutes. Put the pumpkin on the top of the rice and cover the lid immediately. While cooking the rice, heat oil in a wok. Saute the garlic over medium high heat. Add the mushroom. Stir to combine. As the mushroom can absorb lots of oil, add a little of water to cook it instead of using too much of oil. Push the mushrooms to the sides of wok. Add a bit more of oil in the middle to pan fry the chicken until 90% done. 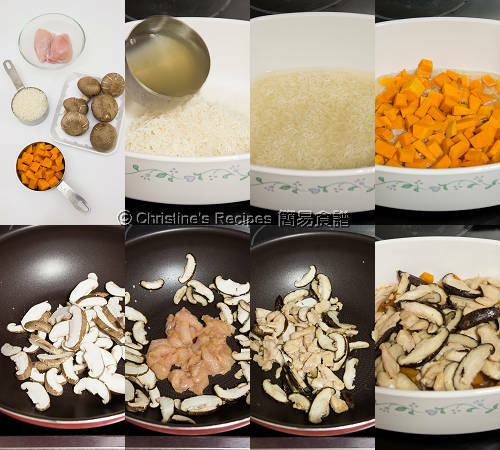 Quickly transfer the mushrooms and chicken onto the rice surface. Cover and continue to cook further 10 minutes. Up to now, the water should be dried up in the pot and the rice is almost cooked through. Turn off the heat. Don’t remove the pot lid and let it sit for 15 to 20 minutes. Done. Garnish with spring onion. Serve hot. Drizzle a little of light soy sauce if desired. I used electric stove to cook the rice. The ratio of rice and water is 1:2. You might like to use rice cooker. Simply use a bit less water than usual. 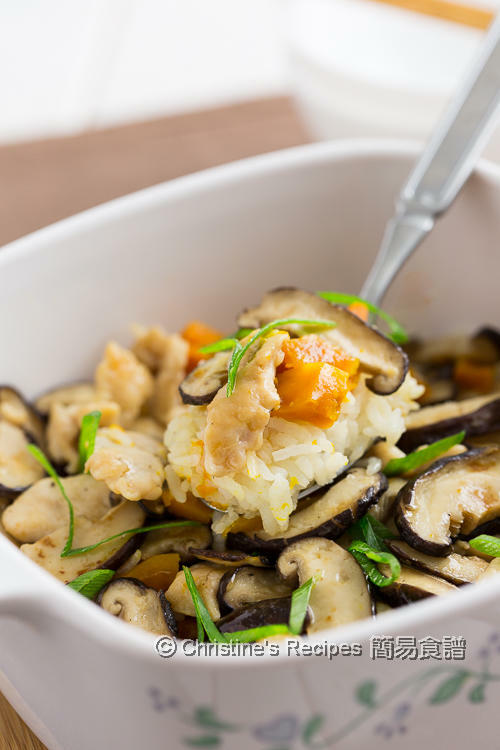 If you see steam releasing from the rice cooker started to reduce, add all the ingredients, pumpkin, mushroom and chicken into the inner pot and quickly cover the lid, trying not to let most of the heat escape. When the rice is done, don’t open the lid immediately. Let it sit for about 20 minutes before serving. Delicious! I have been having roasted pumpkins for days..now it's time to try something different. Wonderful ! Happy cooking, 思思. Im just Trying this Recipes for dinner,and my Boss said its really delicious. Wonderful ! Thanks for trying my recipe. Hi, if I use the rice cooker. Do I still need to stir fry the mushrooms and chicken for a bit? I'd stir fry the mushrooms first to bring up their fragrance, and then put them with chicken into a rice cooker. But you can skip the stir-frying step if you don't want to. It works too. If I use pressure cooker, the ratio rice : water also 1:2? Will the rice too wet? Or depends which type of rice I use? Usually when I cook rice I use ratio 1:1. Thanks in advance. Yes, feel free to experiment. The amount of water in this recipe works with the rice I got. You can adjust to suit your case.